We thought we weren't going to have any, because the raccoons and birds and turtles and such like marauders were ... well ... marauding, chomping up all the blueberries we planted RIGHT NEXT TO THE PORCH to discourage such ... maraudishment. They missed these, though, Charlie having cunningly hidden them in the garden. So there is much joy in the Allen house, and many blueberries. Why ruin the blueberries by surrounding them with carbohydrates? Blueberries- yum! all by themselves (or with yoghurt or cottage cheese). Your recipe is to cooking as minimalism is to the art world: spare and eschewing details or context. One hopes the 'proof' is in the pudding, or batter, so to speak. 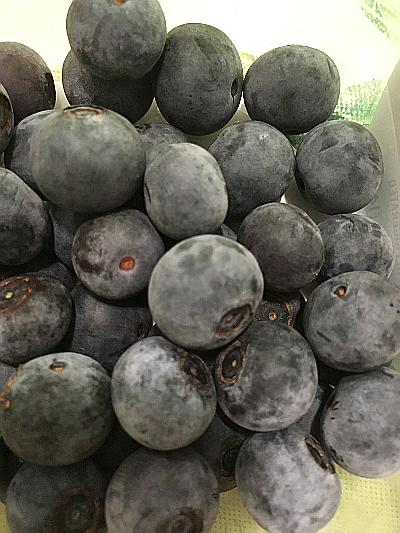 Blueberries ARE delicious all by themselves, but are all the better in a muffin or a pancake. I know, Roy, not to you, not to you. :) But I assure you that IF you like pancakes, pancakes with blueberries and pecans in are superlative!